First Line: A partially open door always has a question in it. When she learns that her dear friend Sarah Nunamaker doesn't have long to live and wants to see her, 63-year-old Maxine ("Maxie") McNabb packs her Winnebago and-- with her miniature dachshund Stretch riding shotgun-- hits the road. It's a long journey from Alaska to Grand Junction, Colorado, and when Maxie arrives, Sarah only has time for a brief cryptic message before she dies. Maxie has no time to grieve; however, she's been appointed executor of Sarah's will. Then Sarah's house is broken into. Someone is searching for something, and Maxie's hoping she has the edge in finding it. Her friend had a penchant for secret hiding places, and Maxie just might be able to find the elusive object someone is willing to kill for. I was in the mood for a soft-edged, intriguing mystery filled with excellent characters, and that's exactly what I found in The Serpents Trail. 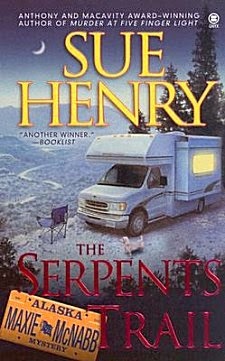 Already familiar with Sue Henry's Jessie Arnold mysteries set in Alaska, I wanted to see what a wandering sixtysomething widow with a small dog and an RV could do. Maxie McNabb is in the minority in the crime fiction community of characters. She's in her sixties. She's widowed after two happy and fulfilling marriages and has no inclination to go that route again. Her friends and her dog Stretch supply all the companionship she needs. She's also got itchy feet and loves to travel all over the continent in her Winnebago. I rapidly fell in love with her independent spirit and level-headedness. Another aspect of her character that I deeply appreciated was that she possesses no desire to be either a victim or a hero. She's smart; she knows her capabilities; and she gets help when she needs it. We need more characters like Maxie McNabb in crime fiction. In many ways, the mystery is a treat, with Sarah's habit of creating secret hiding places all over her house and having a will that creates altogether too much interest amongst those who may inherit. People aren't always who they seem either, and that will and those suspicious characters are the deciding factors in Maxie's little trip to Salt Lake City to do a little sleuthing in Sarah's family tree. The only jarring note in the entire book was the fact that the ending wasn't quite convincing-- but that doesn't bother me much. I've already ordered other books in this Maxie and Stretch series! Characters of different ages have different perspectives, and we need to hear from all of them! I bought this when it first came out in paperback and enjoyed it so much I bought the next one. Then I bought a Nook. Now, I need to go find that second one and read it! Excellent idea, Marty! I'd hate to tell you how many books I have here that have gotten moved gently to the side when newer pretties grab my attention.